It's easy to lose track of one of those little bottles of nail polish, and before you know it, you may have knocked it over and spilled it on the floor. That usually isn't a major disaster, especially if the floor is concrete. Even if you don't notice the spill immediately, and the polish has time to harden, you can usually remove it with little residue and no damage to the floor. The custom of painting fingernails isn't new -- the Incas used to paint eagles on their nails -- but it became especially prevalent in the early 20th century, perhaps as a popular response to the proliferation of shiny, painted automobiles. In fact, nail polish has much in common with automobile paint; it's basically nitrocellulose lacquer, the type of lacquer used on early automobiles. 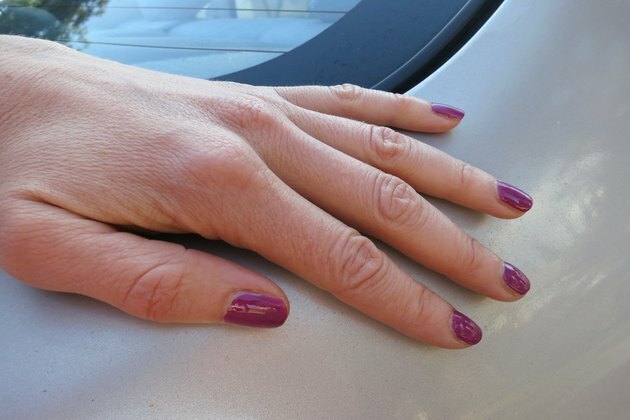 Unlike automobile and furniture lacquer, however, nail polish also contains an adhesive resin to keep it on your nails, a plasticizer to keep it flexible and an ultraviolet stabilizer to prevent color fading. None of these increase the difficulty of cleaning up a spill. If a drop falls from your brush onto the floor when you're polishing your fingernails, it will probably dry quickly, but if a bottle tips over, you may have to deal with a puddle. 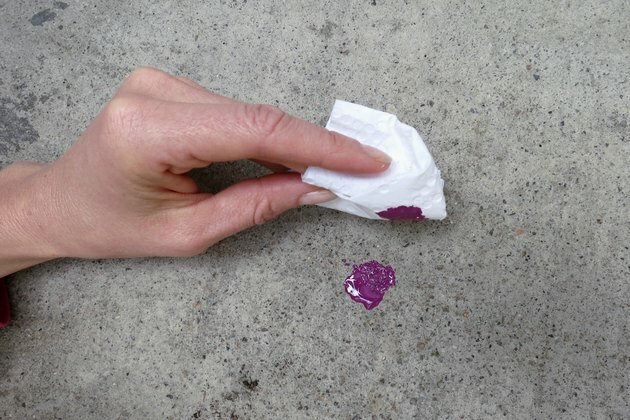 Remove all the wet polish by dabbing it with an absorbent cloth or a paper towel; avoid wiping, because that will just spread the polish around. If the polish has made a discrete blob, it's a good idea to let the blob harden, so you can chip it off with a credit card, paint scraper or chisel. It will leave a spot, and you can remove that with a solvent. Once the bulk of the spill has been removed, you'll have to remove the discoloration from the concrete surface. 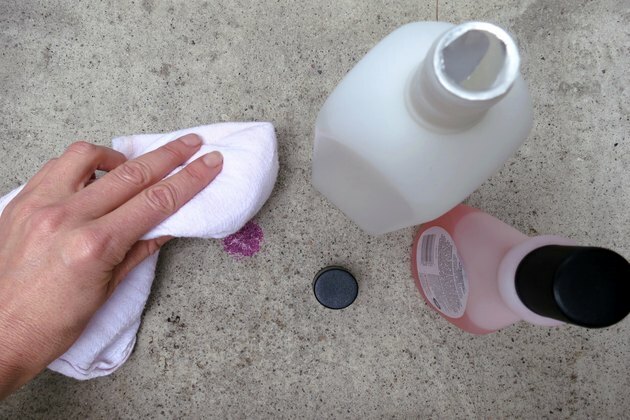 Acetone or nail polish remover -- which are essentially the same things -- will do the job, and if the floor is painted, you shouldn't have to worry about damaging the paint. Acetone isn't strong enough to soften cured concrete paint. Dampen a cloth with the solvent and rub to remove the discoloration caused by the polish. In most cases, you won't have to rub very hard -- you'll find the discoloration easy to remove. When using acetone, it is recommended that you provide for adequate fresh air and wear an appropriate mask and protective gloves. Unfinished concrete is porous, and some of the pigment may remain even after you remove the bulk of the nail polish residue with acetone. You should be able to bleach that out with 3 percent hydrogen peroxide from your medicine cabinet. 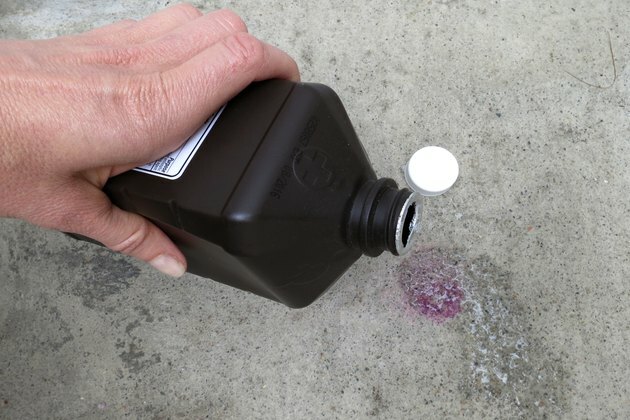 If pouring the peroxide directly on the stain has no effect, combine one or two ounces with an equal part of water and a squirt of dish soap. Saturate the discolored concrete and cover it with a damp cloth to allow the mixture to work. You may have to repeat this procedure once or twice to get all the color out. Can I Lacquer Over Acrylic Paint?